Chimborazo, Ecuador. The point on Earth's surface farthest from its center. 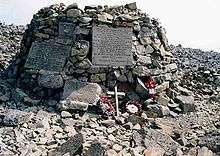 In the United Kingdom and the Republic of Ireland, a mountain is usually defined as any summit at least 2,000 feet (or 610 metres) high, whilst the official UK government's definition of a mountain, for the purposes of access, is a summit of 600 metres or higher. In addition, some definitions also include a topographical prominence requirement, typically 100 or 500 feet (30 or 152 m). 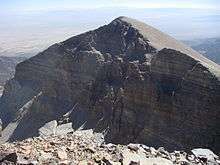 For a while, the US defined a mountain as being 1,000 feet (300 m) or taller. Any similar landform lower than this height was considered a hill. However, today, the United States Geological Survey (USGS) concludes that these terms do not have technical definitions in the US. Fold mountains occur when two plates collide: shortening occurs along thrust faults and the crust is overthickened. 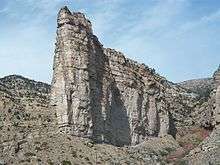 Since the less dense continental crust "floats" on the denser mantle rocks beneath, the weight of any crustal material forced upward to form hills, plateaus or mountains must be balanced by the buoyancy force of a much greater volume forced downward into the mantle. Thus the continental crust is normally much thicker under mountains, compared to lower lying areas. Rock can fold either symmetrically or asymmetrically. The upfolds are anticlines and the downfolds are synclines: in asymmetric folding there may also be recumbent and overturned folds. 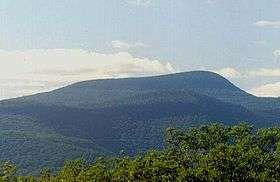 The Jura Mountains are an example of fold mountains. Climate on mountains become colder at high elevations, due an interaction between radiation and convection. Sunlight in the visible spectrum hits the ground and heats it. The ground then heats the air at the surface. If radiation were the only way to transfer heat from the ground to space, the greenhouse effect of gases in the atmosphere would keep the ground at roughly 333 K (60 °C; 140 °F), and the temperature would decay exponentially with height. However, when air is hot, it tends to expand, which lowers its density. Thus, hot air tends to rise and transfer heat upward. This is the process of convection. Convection comes to equilibrium when a parcel at air at a given altitude has the same density as its surroundings. Air is a poor conductor of heat, so a parcel of air will rise and fall without exchanging heat. This is known as an adiabatic process, which has a characteristic pressure-temperature curve. As the pressure gets lower, the temperature decreases. The rate of decrease of temperature with elevation is known as the adiabatic lapse rate, which is approximately 9.8 °C per kilometer (or 5.4 °F per 1000 feet) of altitude. Note that the presence of water in the atmosphere complicates the process of convection. Water vapor contains latent heat of vaporization. As air rises and cools, it eventually becomes saturated and cannot hold its quantity of water vapor. The water vapor condenses (forming clouds), and releases heat, which changes the lapse rate from the dry adiabatic lapse rate to the moist adiabatic lapse rate (5.5 °C per kilometer or 3 °F per 1000 feet) The actual lapse rate can vary by altitude and by location. Therefore, moving up 100 meters on a mountain is roughly equivalent to moving 80 kilometers (45 miles or 0.75° of latitude) towards the nearest pole. This relationship is only approximate, however, since local factors such as proximity to oceans (such as the Arctic Ocean) can drastically modify the climate. As the altitude increases, the main form of precipitation becomes snow and the winds increase. 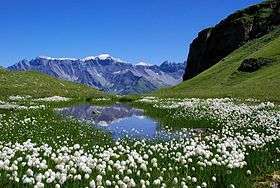 Mountains are generally less preferable for human habitation than lowlands, because of harsh weather and little level ground suitable for agriculture. While 7% of the land area of Earth is above 2,500 metres (8,200 ft), only 140 million people live above that altitude and only 20-30 million people above 3,000 metres (9,800 ft) elevation. The decreasing atmospheric pressure with increasing elevation means that less oxygen is available for breathing, and there is less protection against solar radiation (UV). 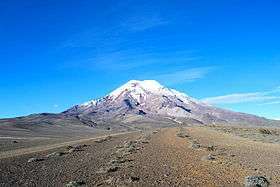 Due to decreasing oxygen, the highest known permanent habitation in the world is at 5,100 metres (16,700 ft), while the highest known permanently tolerable altitude is at 5,950 metres (19,520 ft). Above 8,000 metres (26,000 ft) elevation, there is not enough oxygen to support human life. This is known as the "death zone". The summits of Mount Everest and K2 are in the death zone. About half of mountain dwellers live in the Andes, Central Asia, and Africa. Traditional mountain societies rely on agriculture, with higher risk of crop failure than at lower elevations. Minerals often occur in mountains, with mining being an important component of the economics of some montane societies. More recently, tourism supports mountain communities, with some intensive development around attractions such as national parks or ski resorts. About 80% of mountain people live below the poverty line. ↑ "The 'Highest' Spot on Earth". Npr.org. 7 April 2007. Retrieved 31 July 2012. ↑ Whittow, John (1984). Dictionary of Physical Geography. London: Penguin. p. 352. ISBN 0-14-051094-X. ↑ Nuttall, John & Anne (2008). England. The Mountains of England & Wales. 2 (3rd ed.). Milnthorpe, Cumbria: Cicerone. ISBN 1-85284-037-4. ↑ "Survey turns hill into a mountain". BBC. Retrieved 3 February 2013. ↑ "A Mountain is a Mountain – isn't it?". www.go4awalk.com. Retrieved 3 February 2013. ↑ "mountain". dictionary.reference.com. Retrieved 3 February 2013. ↑ Wilson, Peter (2001). "Listing the Irish hills and mountains". Irish Geography. Coleraine: University of Ulster. 34 (1): 89. doi:10.1080/00750770109555778. Archived from the original (PDF) on 2013-06-27. ↑ "What is a "Mountain"? Mynydd Graig Goch and all that...". Metric Views. Retrieved 3 February 2013. ↑ Helman, Adam (2005). The Finest Peaks - Prominence and Other Mountain Measures. Trafford Publishing. ISBN 978-1412059954. 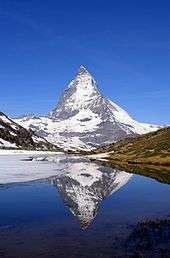 ↑ "What is the difference between lake and pond; mountain and hill; or river and creek?". USGS. Archived from the original on 2013-02-12. Retrieved 11 February 2013. ↑ Blyth 2002, p. 74. 1 2 Blyth 2002, p. 14. 1 2 3 Panos (2002). "High Stakes" (PDF). Retrieved 17 February 2009. ↑ "Chapter 6: Mountain building". Science matters: earth and beyond; module 4. Pearson South Africa. 2002. p. 75. ISBN 0-7986-6059-7. ↑ Gerrard 1990, p. 194. ↑ Searle, Michael P (2007). "Diagnostic features and processes in the construction and evolution of Oman-, Zagros-, Himalayan-, Karakoram-, and Tibetan type orogenic belts". In Robert D. Hatcher Jr.; MP Carlson; JH McBride; JR Martinez Catalán. 4-D framework of continental crust. Geological Society of America. p. 41 ff. ISBN 0-8137-1200-9. ↑ Fraknoi, Morrison & Wolff 2004, p. 160. 1 2 Goody, Richard M.; Walker, James C.G. (1972). "Atmospheric Temperatures" (PDF). Atmospheres. Prentice-Hall. ↑ "Dry Adibatic Lapse Rate". tpub.com. Retrieved 2016-05-02. ↑ Blyth 2002, p. 15. ↑ "Factors affecting climate". The United Kingdom Environmental Change Network. Archived from the original on 16 July 2011. ↑ Blyth 2002, p. 12. ↑ Lugo, Ariel E.; Brown, Sandra L.; Dodson, Rusty; Smith, Tom S.; Shugart, Hank H. (1999). "The Holdridge Life Zones of the conterminous United States in relation to ecosystem mapping". Journal of Biogeography. 26 (5): 1025–1038. doi:10.1046/j.1365-2699.1999.00329.x. Archived from the original on 2013-02-12. ↑ Daubenmire, R.F. (June 1943). "Vegetational Zonation in the Rocky Mountains". Botanical Review. 9 (6): 325–393. doi:10.1007/BF02872481. 1 2 "Biotic Communities of the Colorado Plateau: C. Hart Merriam and the Life Zones Concept". Archived from the original on 2013-02-04. Retrieved 30 January 2010. ↑ Tweit, Susan J. (1992). The Great Southwest Nature Factbook. Alaska Northwest Books. pp. 209–210. ISBN 0-88240-434-2. ↑ "Tree". Microsoft Encarta Reference Library 2003. Microsoft Corporation. 2002 . 60210-442-1635445-74407. ↑ Moore, Lorna G. (2001). "Human Genetic Adaptation to High Altitude". High Alt Med Biol. 2 (2): 257–279. doi:10.1089/152702901750265341. PMID 11443005. ↑ Cook, James D.; Boy, Erick; Flowers, Carol; del Carmen Daroca, Maria (2005). "The influence of high-altitude living on body iron". Blood. 106 (4): 1441–1446. doi:10.1182/blood-2004-12-4782. PMID 15870179. ↑ West, JB (2002). "Highest permanent human habitation". High Altitude Medical Biology. 3 (4): 401–7. doi:10.1089/15270290260512882. PMID 12631426. ↑ "Everest:The Death Zone". Nova. PBS. 24 February 1998. ↑ Blyth 2002, p. 17. ↑ Blyth 2002, p. 22. ↑ "International Year of Freshwater 2003". Archived from the original on 7 October 2006. Retrieved 7 December 2006. ↑ "The Mountain Institute". Archived from the original on 9 July 2006. Retrieved 7 December 2006. ↑ Cox, Steven M.; Fulsaas, Kris, eds. (2009) . Mountaineering: The Freedom of the Hills (7 ed.). Seattle: The Mountaineers. ISBN 0-89886-828-9. ↑ "Nepal and China agree on Mount Everest's height". BBC News. 8 April 2010. Retrieved 22 August 2010. ↑ Helman, Adam (2005). The Finest Peaks: Prominence and Other Mountain Measures. Trafford. p. 9. ISBN 1412236649. the base to peak rise of Denali is the largest of any mountain that lies entirely above sea level, some 18,000 feet. ↑ "Mountains: Highest Points on Earth". National Geographic Society. Retrieved 19 September 2010. ↑ Kaye, G.D. (2002). "Using GIS to estimate the total volume of Mauna Loa Volcano, Hawaii". 98th Annual Meeting. Geological Society of America. ↑ Krulwich, Robert (7 April 2007). "The 'Highest' Spot on Earth?". Retrieved 21 March 2009. Blyth, S.; Groombridge, B.; Lysenko, I.; Miles, L.; Newton, A. (2002). "Mountain Watch" (PDF). UNEP World Conservation Monitoring Centre, Cambridge, UK. Retrieved 17 February 2009. Fraknoi, A.; Morrison, D.; Wolff, S. (2004). Voyages to the Planets (3rd ed.). Belmont: Thomson Books/Cole. ISBN 9780534395674. Gerrard, A.J. (1990). 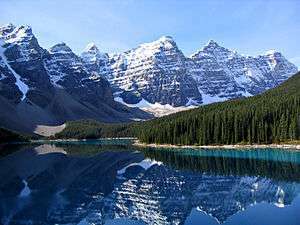 Mountain Environments: An Examination of the Physical Geography of Mountains. Cambridge, Mass: MIT Press. ISBN 978-0262071284. "Mountain". Encyclopædia Britannica. 18 (11th ed.). 1911.